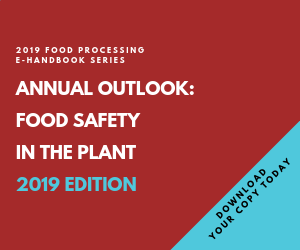 A lot of food-safety attention is paid to the equipment and the steps in the manufacturing process, but recent incidents remind plant managers and others to also look up … and down. Water on the floor is common in many types of food & beverage plants, but it better not be dripping from the ceiling and be careful in cleaning out floor drains. While numerous nasty conditions and missteps led to the 2008 recall by Peanut Corp. of America, one probable source of contamination was not discussed until after the more publicized infractions at the Blakely, Ga., plant. Citing court testimony and inspectors who checked the plant, the Atlanta Journal-Constitution implicated a leaky roof. “I suspect it was so bad that it was raining in there,” said Ron Simon, attorney for some of the people suing the peanut company. Testimony indicated PCA spent $60,000 on roof repairs in August 2008.The leaky roof is suspect because there’s one thing needed most for salmonella to grow, spread and thrive: water. Some theorize that when it rained, water could have entered the plant and multiplied any existing salmonella or even introduced the salmonella into the plant, the newspaper reported.A leaky roof also is one suspected culprit behind the 2006-2007 ConAgra peanut butter recall. “Allowing water to get into a dry [processing] environment would be like putting gas on a fire,” Michael Doyle, director of the University of Georgia’s Center for Food Safety, said in the Journal-Constitution article. Also, don’t think you can just wash troubles down the drain. Recent research from Kansas State University, part of the Food Safety Consortium, found washing floors and particularly floor drains in food processing facilities could actually make it easier for listeria monocytogenes to travel from the drain to points on the processing line. The researchers already knew the open floor drains in processing environments can harbor bacteria, which is why those drains are the targets of high-pressure washing and cleaning. But they discovered the aerosols generated by the washing can transfer the bacterial cells upward onto surfaces where food is being processed a few feet above the floor. After a high-pressure wash-down of the floor, the research team found L. monocytogenes at heights of 1, 3 and 5 ft. above the drain level, with the highest concentration at the 1-ft. level closest to the drain. More bacterial cells were present on the contact surfaces after 48 hours than after eight hours, meaning they multiplied. In the old days, cast iron was the state of the art in underground pipes leading out of food plants. People just didn’t realize that the cost of upgrading to the more resilient stainless steel or PVC was worth the investment. What will the future bring? Given the critical nature of food safety and the insanity of the world we live in, one AEC expert urges an evolution beyond current-generation metal and foreign-object detectors. He wants to see more comprehensive methods for chemical and biological contaminants — not just in the lab, but in real time. Today, better designs prevent drains from harboring unwanted microbial guests, and new plants use stainless drains and traps that dump into PVC, cPVC, or polypropylene pipes. And most food processors agree with their AEC firms when renovating: It’s safer and more cost-efficient in the long run to gut the whole building to the bare earth, structural steel and pre-cast concrete shell than to assume there are no unseen gremlins below the surface. The tiny gremlins aren’t always below ground; they can hide in hollow metal doorframes and window sills. Plants, however, can buy solid fiberglass frames with composite lumber and high-density polyethylene even on internal components. Why? Because a caulk failure combined with an errant high-pressure hosing can let moisture in and start a colony of unwanted stowaways. Not all innovations are cost-effective, Follmer points out, noting he’s “not seeing a whole lot of use” for antimicrobial additives to coatings on floors and other surfaces. They got some notoriety when introduced a few years ago. Antimicrobials are useful in areas that are hard to access or clean, and they’re used on some bacteria-prone conveyors and food contact surfaces. But they may not be completely worth the cost and effort. “A study from one of our clients showed that if they cleaned an area every day, antimicrobials became more of a precautionary measure than a necessary one,” he says. Leave space around equipment for cleaning and maintenance. Process piping should employ vertical runs for piping to eliminate ledges and remove capped-off dead legs. Eliminate overhead piping, trusses, platforms, catwalks and supports in food handling areas. Suss-out pockets that can foster harborage in floors, walls and ceilings, caulked seams and sheet metal surfaces. Reinforce personal hygiene with hand-sanitizing stations at employee entry points. Reduce manual touch-labor with automation to minimize employee handling in places such as picking and placing and in product transfers from one conveyor to the next. As an added benefit, companies that put in automation systems for safety can further improve quality, efficiency and productivity. Walkable ceilings that help separate non-hygienic equipment from plant-floor operations. Use of stainless steel-clad freezer panels for non-freezer applications such as interior wash-down area walls. HACCP requirements are driving more installations of foreign material detection equipment and mix-proof valves, which allow more frequent cleaning of processing lines without scheduled shutdowns. Three-dimensional and virtual reality walk-throughs to reveal potential crevices that traditional 2D drawings can hide; they also allow an “inside look” at equipment prior to fabrication. Automation and information technology for accountability from storage and retrieval to traceability across the supply chain. A good eye can keep an old plant new indefinitely. Shambaugh & Son (www.shambaugh.com), Fort Wayne, Ind., for example, is in the midst of a $65-million renovation of a dairy facility originally built in 1912. The expansion includes a new dryer and other process upgrades, refrigeration, a new boiler system and additional upgrades to the plant infrastructure. Upgrades include sealed concrete platforms, water-free zones, personal traffic control, cleanable/sealed wall and ceiling materials and heating, ventilating and air conditioning (HVAC) systems that control negative and positive air flow. But before putting virtual ink to computer-aided design paper, engineers approach the site by walking the grounds. “The exterior design of a food processing facility affects the cleanliness and safety of the food made inside,” says CEO Mark Shambaugh. He starts by looking around the building for potential risks. These include consideration of worker and visitor traffic patterns, vegetation and landscaping, roofing and invitations for rodents and pests to crash the party with uninvited pathogens riding piggyback. “Starting at the property line, the facility should have separate approaches for various types of plant traffic,” he says, to prevent different kinds of traffic from crossing paths. Since vegetation can attract bacteria-carrying insects and birds, he keeps it a minimum of 100 feet from buildings and sidewalks, and he lays down vermin strips in the DMZ between the two. Up top, he says proper roofing can avoid major contamination problems, such as cracks caused by freezing and thawing, gravel breaking apart and oils from HVAC vents that deteriorate membranes. Another nagging, new reality: The events of Sept. 11, 2001, shook food companies, along with their customers and government regulators, from its blissful complacency with regard the risk of human miscreants posing chemical and microbial risks.